Gingerbread is not just for Christmas! 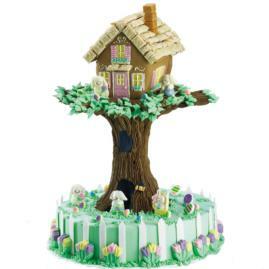 Why not spend a day with your family welcoming Spring with a yummy 3D Gingerbread cake. This Hopping High Rise cake takes 3-D design to new heights. A decorated Pre-Baked Gingerbread Bunny Hutch sits on a separator plate “treetop” that’s attached to the top of a Tall Tier Cake Stand column that’s been turned into a tree trunk. Recipe here.